At the top of the rustic, earthy, lovely food to eat and make list- baguettes! 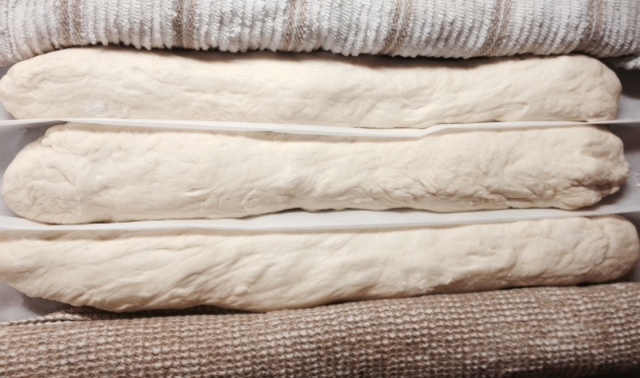 On the yeasty, satisfying, work with your hands list- baguettes! 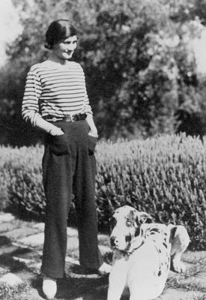 Put on your berets and Breton striped shirts– let’s make baguettes! This recipe is very simple. 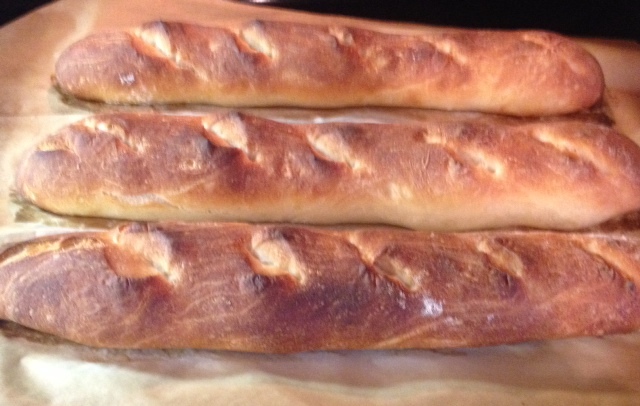 If you can knead dough (you can, the ability is buried in your genetic code) or have a stand mixer to knead dough for you, you can make these beautiful baguettes. 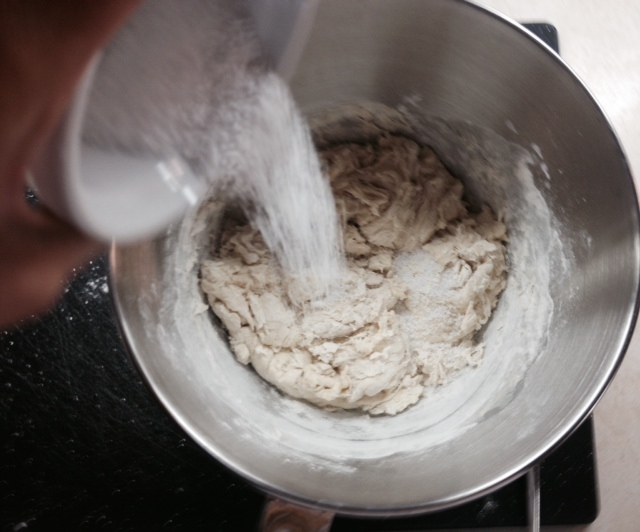 There’s a lot of waiting involved as the dough rises; hands-on time is minimal. Baking these lovely parcels of dough is a rewarding, foolproof venture. Let’s get to it. 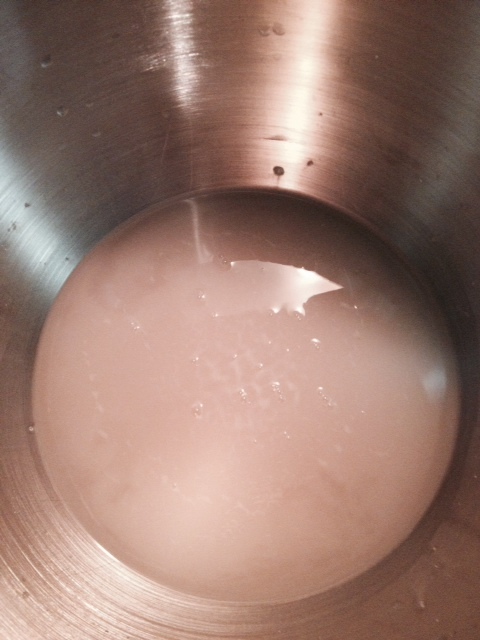 In a large bowl or your stand mixer’s bowl, whisk the hot water into the yeast. Let it sit for ten minutes, until foamy. 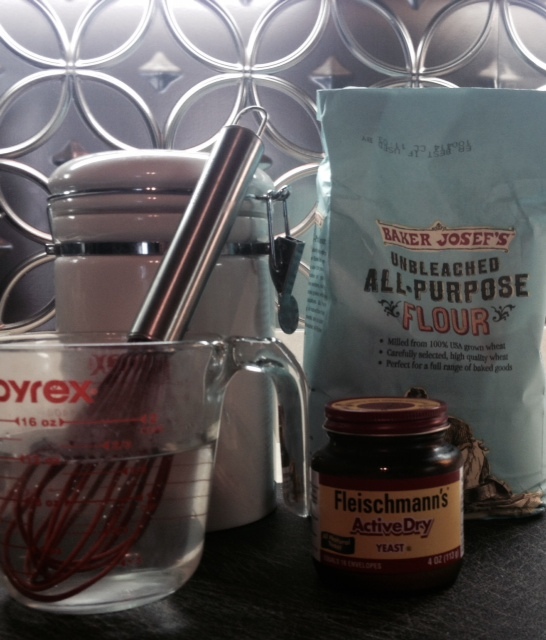 When ten minutes has passed, mix the flour into the yeast and water with a fork, until a shaggy dough forms. I did this in four pour of flour for even mixing. Let this sit for 20 to allow the flour to hydrate. You’re getting the hang of this waiting stuff by now, aren’t you? Good. There’s more to come. After 20 minutes, add the kosher salt. Attach the bowl to the stand mixer and knead with the hook attachment for 4-5 minutes on speed 2, until the dough has climbed up the hook and is smooth and elastic. Alternatively, knead the old-fashioned way: turn dough out onto a lightly floured surface and knead for 10 minutes with the heels of your hands. “A good knead is better than an hour of psychotherapy, and it’s free.” There’s your motivation. Exorcise the demons. 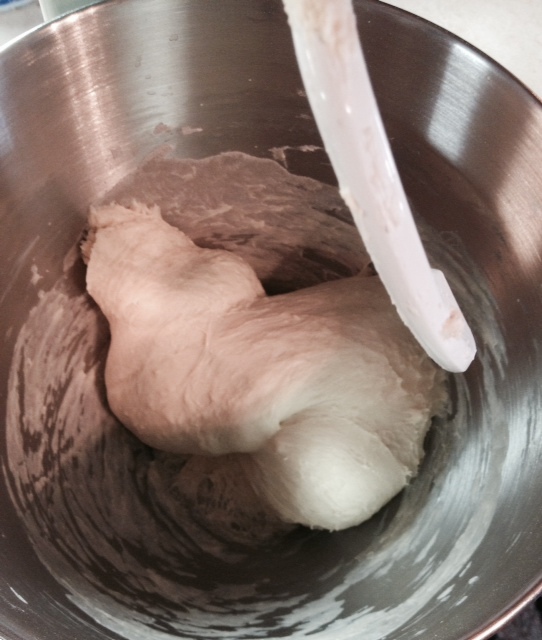 When your dough is smooth and shiny and elastic, oil a large glass bowl with the half tablespoon of canola. Pat the dough into a ball and place it in the bowl; cover with plastic wrap and let rise in an oven or microwave until doubled in size, about 45 minutes to an hour. 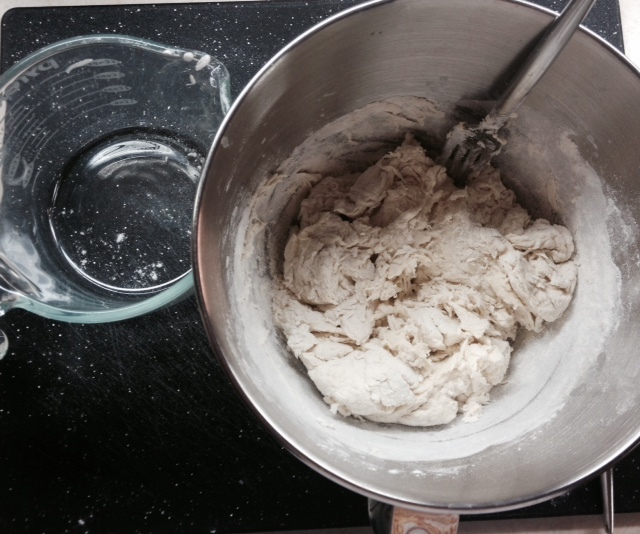 Once doubled, remove the dough and turn it out onto a lightly floured surface. Shape it into a 6×8 inch rectangle, then fold the long sides into the middle, followed by the short sides. Basically, double fold it into a little bundle. Pop the bundle back into the oiled bowl and let double again, another 45 minutes or so. I hope you have a good book to read, what with all of this sitting around, sheesh. Consider this AbeBooks list of food memoirs if you don’t. Just looking at the covers makes me hunger for a memoir marathon… I’ll need a rainy Sunday, a cozy blanket, and a LOT of supplemental food. 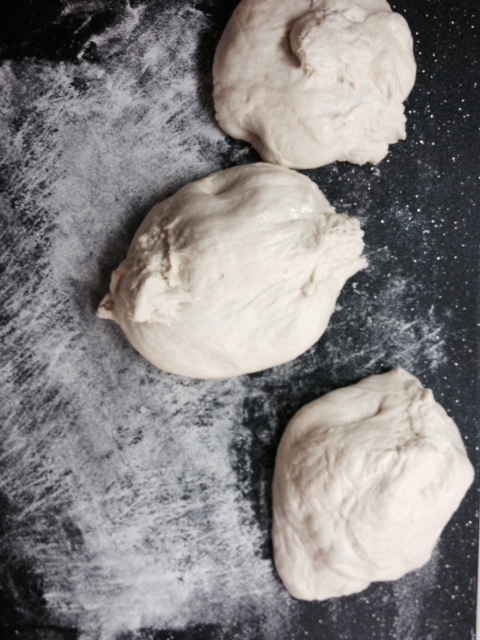 Now we get to play with the dough! 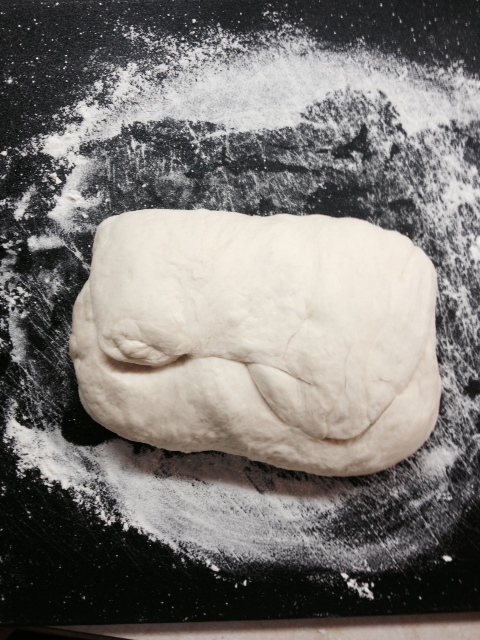 Turn the lovely bundle onto a very lightly floured surface and pinch off into three equally sized sections of dough. Roll and pinch the rounds into 14-inch logs; these will be the base shapes for your loaves. Grab your rimmed baking sheet and flip it over. 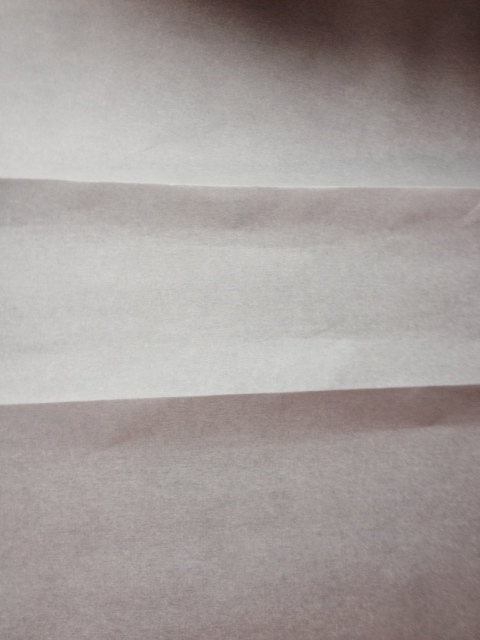 Arrange a piece of parchment paper 3 inches wider than the sheet and fold two pleats into it. Lightly flour the pleated parchment paper. Put the loaves in the spaces you’ve created on the parchment paper and pull them close together- we’re using the pleated paper to allow the loaves to rise up, not out. Roll the two kitchen towels up and place them on either side of the three loaves. Let the loaves rise until doubled. LAST TIME, I promise. Place the cast iron skillet on the very bottom rack of your oven. Arrange a rack right above that and preheat the oven to a blazing hot 475. To make the baguettes look like baguettes, cut slices into the tops of the dough at 30 degree angles with your scissors (add that to your baking bag of tricks!). Very pretty. Flatten out the parchment paper and pop the baking sheet, still inverted, into the oven. Immediately add the 1/2 cup of ice cubes to the cast iron skillet and close the oven door. The ice cubes will sizzle away and release steam, producing a crisp crust. Bake for 20 minutes, until a deep brown. Let cool and serve! They will be crispy on the outside and chewy on the inside. 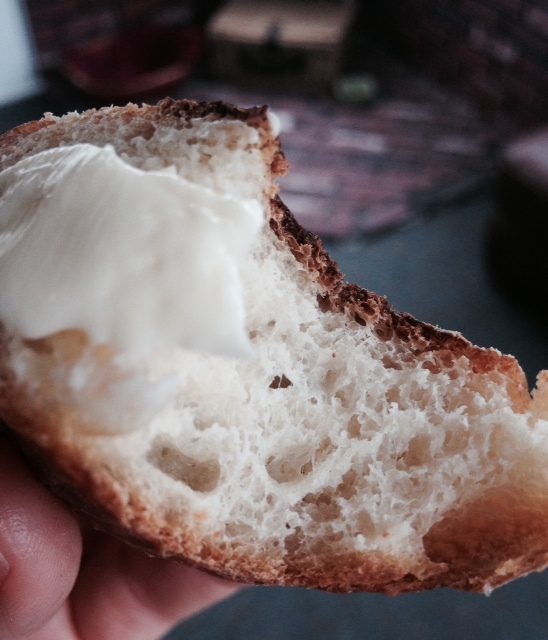 Slather with butter and kick back. Bon appétit. 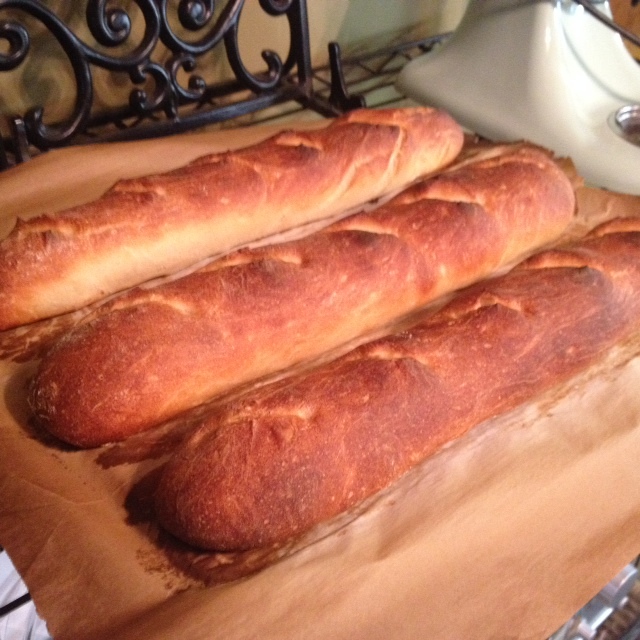 This entry was posted in Baking, Breakfast, Classics, Easy, Fancy, Vegan, Vegetarian and tagged baguettes, classic baguette recipe, easy bagettes, French bread, French recipes, homemade baguettes, homemade bread. Bookmark the permalink. Great entry! Sounds hard for Mah!